Concerto in A Major, K622 (Clarinet and Piano). 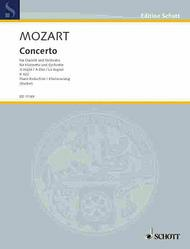 Composed by Wolfgang Amadeus Mozart (1756-1791). Arranged by Alan Hacker. For Clarinet, Piano. Schott. Piano Reduction with Solo Part. 68 pages. Schott Music #ED11149. Published by Schott Music (HL.49002678).